Without a doubt, China is the world’s number one source of international students. Asia has driven much of the dramatic growth in international student mobility over the past decade and more, and China accounts for a significant share of that growth and of overall mobility within and from the region. The Internet is another major factor in international education of course, both as an enabling factor in the growth of markets around the world but also as a platform for new ways of connecting with, engaging, and recruiting international students. But China’s Internet is different from the web as experienced in much of the rest of the world in some important ways. Many countries block or modify, with varying degrees of success, some types of content or major Internet services. But the scale of effort and technology employed in China to monitor and filter Internet traffic is virtually unparalleled and this introduces some very basic, practical considerations for international recruiters. Have you invested heavily in building your Facebook audience? Or do you have a robust YouTube channel with lots of rich video content? Good for you if you have, as these are invaluable channels. But relatively few users in China are going to see them since both services are banned by the Chinese government. Partly because of this virtual wall, China has developed a distinct Internet culture, complete with its own major platforms and services, the largest of which rival the global audiences of some of the world’s best-known Internet brands. For example, Youku and Tudou (the leading video-sharing sites in China, which merged in 2012) boast a combined audience of 400 million unique viewers each month – that’s roughly 40% of YouTube’s global audience. For many Chinese users, these homegrown social media platforms are the Internet – that is, they are both the primary activity for users as well as the main way in which they experience the web. The explosive growth of China’s social web in recent years coincided with the emergence of mobile technology, in particular the rapid adoption of smartphone devices. Many Chinese users first began to use the Internet on mobile devices, and mobile remains the predominant form of access in China today. 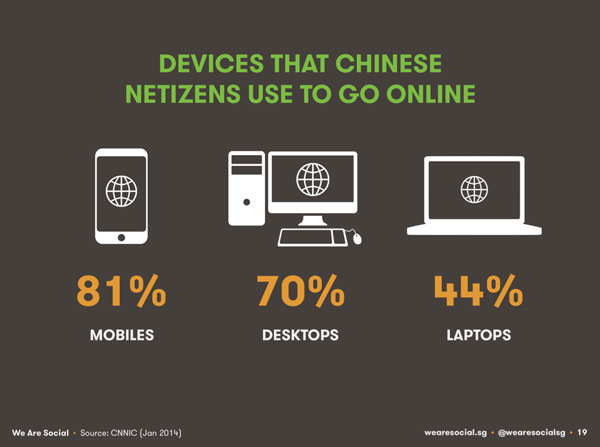 In 2014, 81% of Chinese users reach the Internet via a mobile device, and 58% of the videos viewed in 2013 were seen on mobile devices. 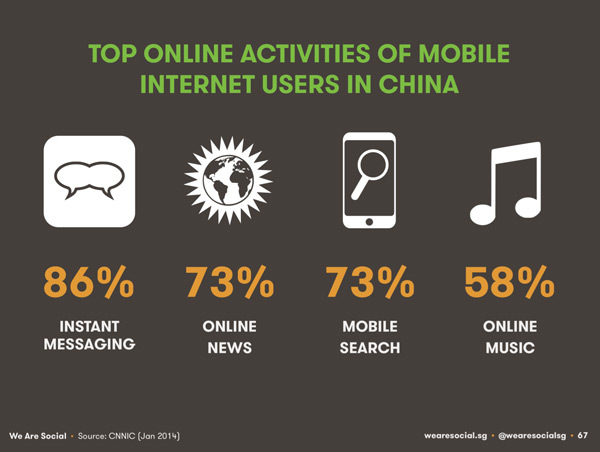 The consulting firm We Are Social recently released a report – China Digital Landscape 2014 – that paints a vivid picture of Internet usage in China and of the country’s social web in particular. The report estimates there are 618 million Internet users in China – representing nearly half of the country’s population (and twice the total population of the US) – and that the average Chinese user spends 25 hours online every week. 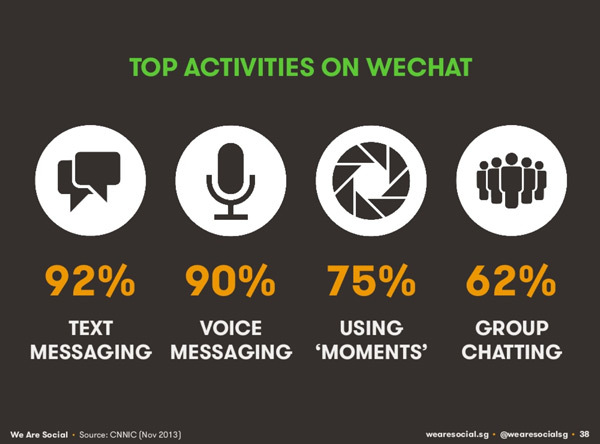 Instant messaging is reported as the leading online activity for Chinese users but this is a category of usage – more on which below – that goes much beyond simple messaging activity. Many foreigners are familiar with China’s first major social networks, Weibo (similar to Twitter) and Renren (similar to Facebook). However, the landscape has shifted dramatically in the past few years with the emergence of new networks and services. 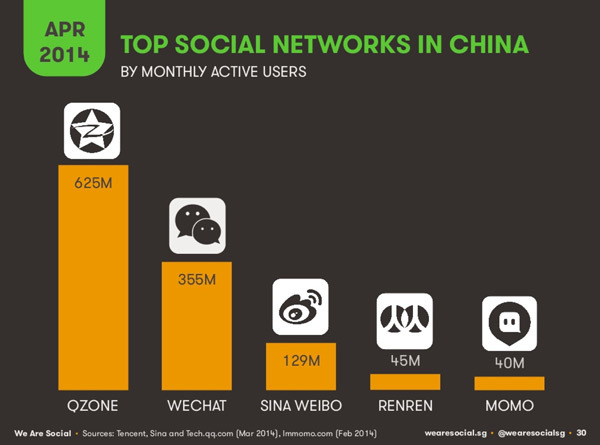 There is now a larger field of social networks in China and some new leaders in the mix, too. Qzone is China’s largest social network. Also known as QQ, the service has 625 million active users each month, representing more than half of Facebook’s total global population of active users. The following charts show Qzone’s market position in relation to other leading networks in China, both in terms of total registered users and with respect to monthly active users. Even though the market has become more fragmented in some respects with the emergence of additional, competing networks, actual usage remains relatively concentrated. For example, 46% of all social network users in China use both Weibo and WeChat – the implication being that, even though the landscape has become more complex in recent years, you can reach a very large proportion of China’s social network users through these two services alone. 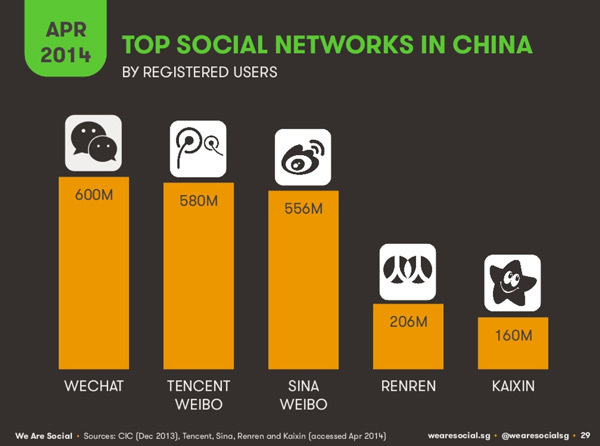 WeChat has been the big story in Chinese social media of late. First released by Tencent in 2011, the service has grown to become one of China’s largest social networks in the three years since. WeChat supports multiple languages and, along with its more than 350 million active users in China, the network has an estimated 70 million users overseas as well. WeChat is an instant messaging app, similar to WhatsApp, but it offers a lot more. 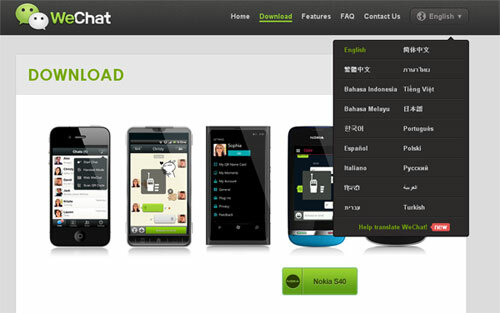 It allows users to send any kind of message – text, voice, video, photos – with no restrictions on file size. But its “moments” feature creates a very sophisticated, and private, Facebook or Twitter-like news stream that further encourages sharing and user engagement. As is the case on other global networks, WeChat supports commercial use with dedicated account types for businesses. The service also features a robust mobile payment infrastructure that is used to support everything from impulse purchases to special sales offers direct to consumers to group buying behaviour (booking group travel, for example). Chinese social media consultant Dana Chen has an excellent blog on how foreign institutions are using China’s social web to connect with and engage prospective students. 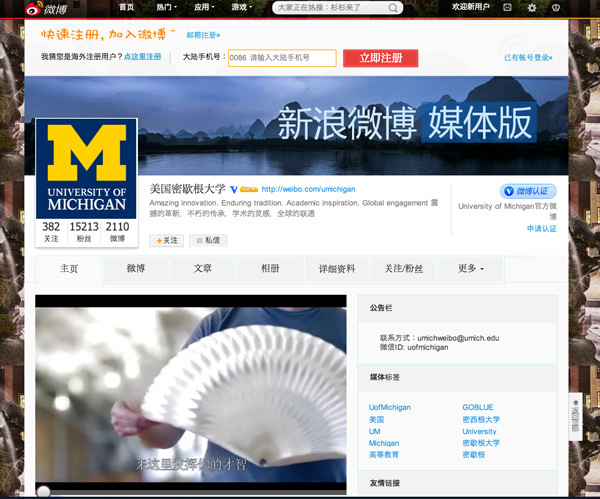 Ms Chen points to the University of Michigan’s use of Weibo as a particularly sophisticated and fortunate example. The university’s Director of Communications has extensive experience in Asia, and Michigan has set up a press room to provide content to a variety of channels and audiences across the world. 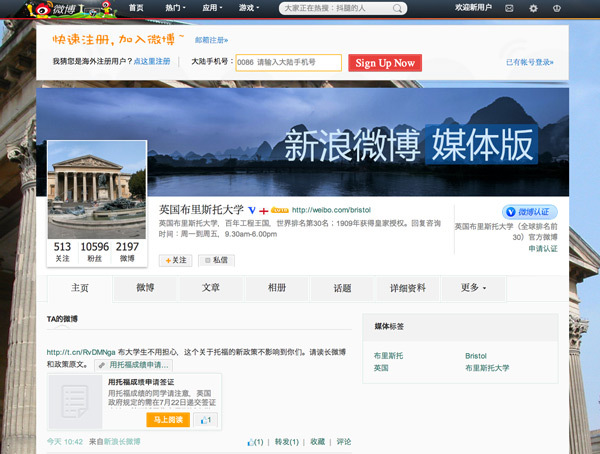 On Weibo, its focus is on engaging with fans by providing support for students and fielding questions from prospects. If you are not so lucky as to have a fully staffed and internationally oriented press room at your disposal, you can still effectively engage students and stakeholders via social networks in China. Some institutions have relied on social media agencies in China to build their profiles but as the cautionary example of Yale University illustrates, there are some risks in attempting to build an audience too quickly via third party media agencies. With respect to the “to agent or not to agent” question and otherwise, we are beginning to see some emerging best practices for social media marketing in China, largely based on the experience of institutions that have been active on Chinese social networks in recent years. When it comes to working your way up the learning curve, a consultant or agency can help orient you to social media in China – who is who and the do’s and don’ts – but in most cases an external agency probably can’t take the place of a solid in-house initiative. That internal effort begins with appropriate staffing. You will need a Chinese-language speaker to navigate the country’s social networks, and, particularly if that staff member is a junior employee (or perhaps even a current student or recent graduate), their work needs to be closely tied to a more senior manager who can provide oversight and support. Along with the language barriers, another challenge to overcome is providing responses to user questions or requests in real time, especially over many time zones. Managing available staff coverage for maximum responsiveness is one step in overcoming this hurdle but Ms Chen points to another interesting approach from Bristol University which has established Q&A hours on its Weibo page that correspond to times when staff are available to deal with queries right away. Next, don’t forget to connect the dots. If you operate accounts on social media networks in China, make sure to link back to your other online channels, including other relevant social platforms and of course your own website. Ms Chen points to the further example of The Hague University to illustrate how an institution can effectively link its Weibo account to its Chinese-language site. build your audience for the long-term. In China, as elsewhere on the social web, these are durable ideas for success and for building real engagement with fans, prospects, students, parents, and alumni. This entry was posted in Asia, China, Marketing, Most Popular, Regions and tagged backpackers marketing, marketing study abroad to parents, Most Popular, online marketing, mobile marketing.